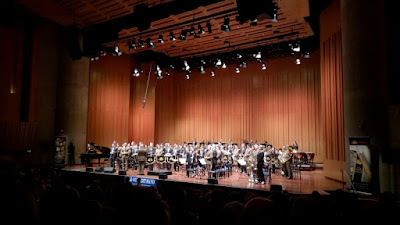 Many thing were working in favour of the Yale Concert Band visit to Canberra. They are on tour, to celebrate their 100th anniversary; this is their 6th continent (since the '50s - not this tour; presumably the penguins await their turn); the support was the RMC Band who are in their 50th year; the gig was free with donations to Legacy which is celebrating its 90th year. And Llewellyn was full, with the upstairs open. Conductor Thomas Duffy said this is the best attended concert of the tour so far. Great! And what a sound. Firstly the military professionals performed, led by visiting conductors from the their Music School. Then the Yale band made up of students in various subjects at Yale. We were told that Yale teaches composition and some other music matters but not performance: YCB comprises students of STEM, humanities, arts, whatever. And such different looks: RMC members in service dress military brown; YCB in tux and black dresses. Then all in for a few final numbers in force. I loved the sweet and pure sound of the wind and especially brass. YCB were all wind other then percussion, piano and harp. RMC had double bass, drums and electric guitar. All was instrumental except for one RMC piece where Toni Maxwell, a local Canberra reservist sang As if we never said goodbye, from the musical Sunset Boulevard. That's also the first time I'd heard the new PA, at least for music. I wasn't at an ideal location, but it seemed quite transparent and hugely willing and the sounds spread nicely to the front rows where I was sitting. Thy each played some originals as well as folk tunes. One member of the YCB came forward to conduct his own composition, a fanfare themed on Google's original motto, Don't be evil, and the anniversary of Kubrick's film, 2001:A space odyssey with references to Daisy. There were pieces by Bernstein, Grainger, Vaughan Williams and Eric Whittaker as well as lesser known names that I didn't catch. Director Thomas Duffy conducted one of his tunes, Century shout : urban march that recounts the history of a city with its bricks and industry and waves of immigrants. And finally, my pleasure in hearing Llewellyn so full of sound. Concerts bands fit that space: they are big and loud and satisfying where even a symphony orchestra can get somewhat lost. So I enjoyed this gig. Varied and interesting and aurally satisfying. Yale Concert Band performed under Thomas Duffy (conductor) with Band of the Royal Military College, Duntroon at Llewellyn Hall. 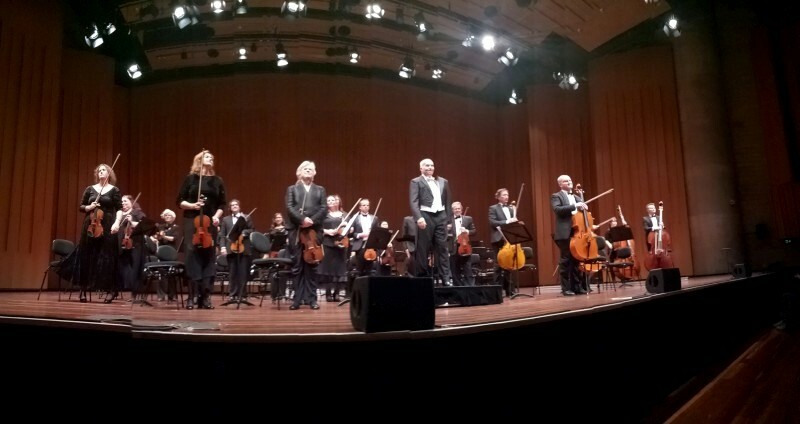 This latest pleasure was to play with the Forrest National Chamber Orchestra. Gillian Bailey-Graham formed the FNCO in 2007 to provide experience for advanced string students in the string orchestra repertoire and to develop technique. I've just heard them once before, at Wesley, although I've played with Gillian in Musica da Camera for the last year. I joined too late to get my mind fully around the difficult, main piece of the concert, Dvorak Serenade no.1 in Emajor, although the others were mostly OK. They were Purcell Abdelazer suite, Marcello oboe concerto, Sibelius Romance and Faure Pie Jesus. 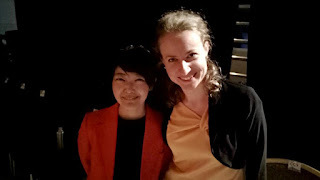 Gudrun Drake joined for oboe on the Marcello overture; Jackie McIntyre sang the Faure; Gillian conducted most works but Shilong Le conducted the Marcello; Rebecca Lovett led as concertmaster. The Faure was to die for, the sort of work that brings tears to eyes, and Jackie did a wonderful job on it. The oboe concerto was a neat baroque piece what Gudrun played with clarity and a capable commitment. The orchestra contains a mix of experienced, mature players, several with professional, orchestral experience, and young but serious students. It's another little-known gem in Canberra. Another discovery was the room: the Canberra Girls Grammar Chapel with the altar as stage. I've heard concerts there but never performed on the altar. The very first notes I played on bass felt huge and others confirmed it's a great acoustic. Acoustics must fit performance, of course, but it worked for this group. I expect it's various ceiling and wall shapes and angles that reflect sound back to the altar. Whatever, it was nice. 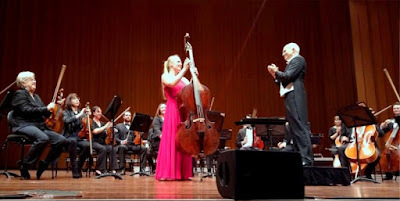 And hi to Nari who doubled my bass on her cello for the Dvorak and others. 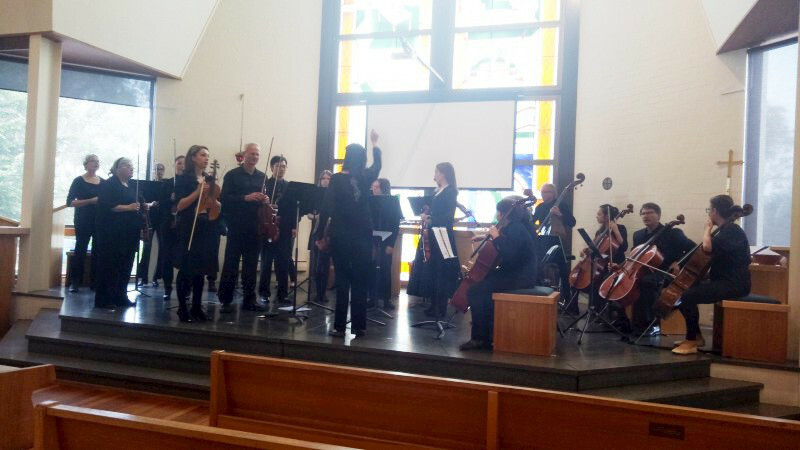 Forrest National Chamber Orchestra performed Purcell, Marcello, Sibelius, Faure and Dvorak at Canberra Girls Grammar School Chapel under Gillian Bailey-Graham and Shilong Ye (conductors), Rebecca Lovett (violin, concertmaster) with soloists Gudrun Drake (oboe) and Jackie McIntyre (vocal). I'd seen hints of it before, but I'd never really appreciated the jazz following at the National Press Club gigs on Friday evenings. 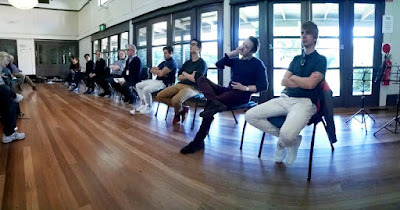 The players are there: some of the best players in town play there and it's been largely organised around the staff of the ANU jazz school. It wasn't unlikely, but it wasn't so obvious in the upstairs bar. That's an attractive and interesting space with balcony and niches and odd angles so attracts a crowd, but it's currently under renovation and the stayers have moved downstairs to a windowless carpet-lined ballroom with a portable stage and what must be a windowed recording/broadcast space. It's the room used for visiting speakers at the NPC, perhaps expanded for the big names and news-worthy pollies. We were offered the extensive stage but chose the more democratic floor-level. 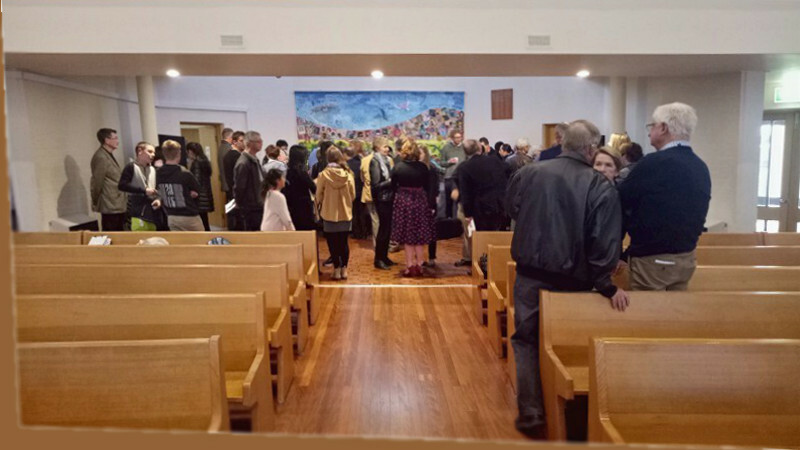 The audience was spread around ordered tables and chatty but also ready to applaud. They liked the pop-turn at the end as our Bad Plus moment and came up afterwards for a chat. We like that. So I discovered something about this crew last night: that there's a discrete but seemingly regular and committed jazz scene at the NPC Friday evening sessions. Perfectly understandable given some of the names that play there and a great pleasure for Tilt to be included. 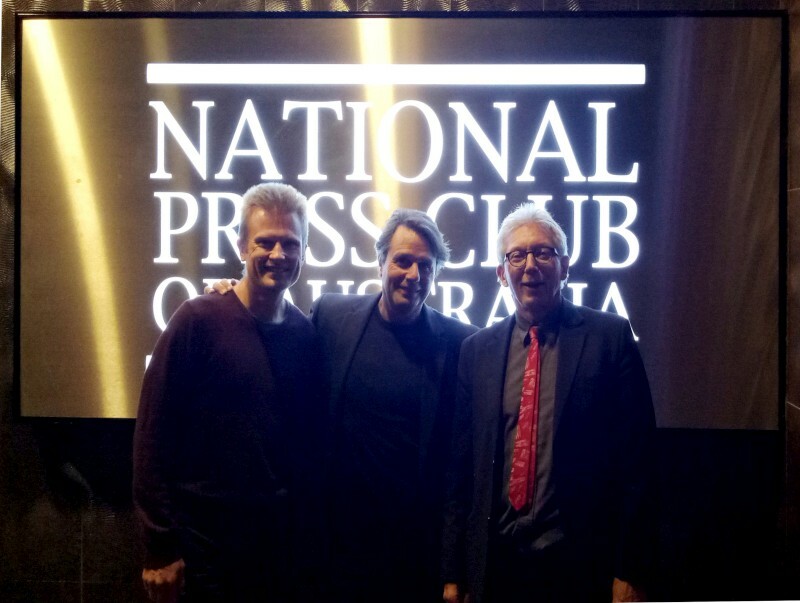 Tilt Trio performed at the National Press Club. Tilt are James Woodman (piano), Eric Pozza (bass) and Dave McDade (drums). 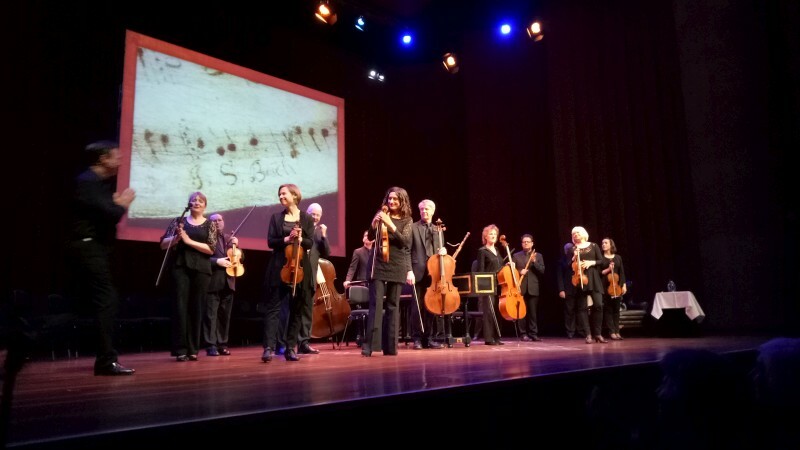 Tafelmusik were in town again and they are so inventive, breaking so many barriers. Apparently, they were early period music investigators and their playing is certainly something to dream of. Sweet, shared, responsive, gentle, quick and lithe when it's called for. They also have a choir but we just saw the orchestra with narrator. Then they make a big thing of playing (at least some) programs from memory. 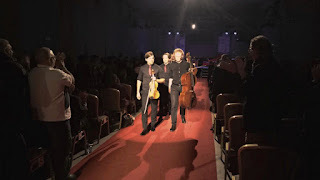 It's a challenging task and time consuming to prepare for but the benefits were clear in the ease of interaction and the movement on stage and, I guess due to both these characteristics, the ease and mobility of phrases moving between instruments. I've never noticed these changing features quite like this and it was revelatory. It's pretty obvious, really, when you think of it. Canon playing is all about a line moving between performers, so why not move the focus of the orchestra with it. They did this and it was eye-opening and I reckon the break away from the written score is partly what promotes this. Then, again for something different, this was more a visit or investigation of Bach's experiences rather than just a performance. On top of the delicious playing, we had projected images (of Leipzig, cafes, luthiers, Australian-NZ sheep [? ], ...) and a script that introduced people and places and instruments and their making and the rest. We learnt of Zimmerman's coffeehouse where Bach led a performance each Friday; of Apollo and Mercury as patron gods of Leipzig; of clothing regulations; of Haussmann's painting of Bach. All quite fascinating and new to some degree to most in the audience, I guess. But it was the music that was central. It comprised different combinations of players, perhaps a few violins, or two cellos or larger groups. The phrasing was delicious and to die for. The tones were gut and sweet (if somewhat lost in the space that is Llewellyn as I sat well back in the first half). The bows were period, none less obviously than Alison Mackay's arcing bass bow. The oboe sounded so good and the bassoon bass lines were so lovely. Bassoon does a fine bass line and this playing was special. And that physical movement that was central to the experience. Good on them for trying this informative performance even if, at times, I longed for just the perfectly sweet music itself. And we got to sing along (!) Just to a scalar fragment that formed a bass line to demonstrate the development of canon lines around it. This demonstration just convinced me that those Zimmerman session would have contained plenty of improvisation, perhaps around an indicative line from Bach, using the venue's collection of instruments. Playing was different then. As we hear with period music. 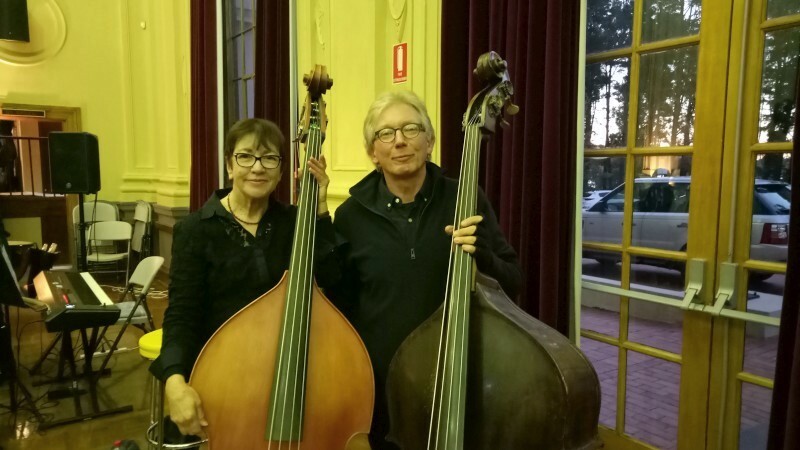 Then after, there was a chat with three member of the orchestra and I was lucky enough to meet Alison Mackay, bassist and developer of this performance. A revelatory night of mixed media and the most delicious period performances. 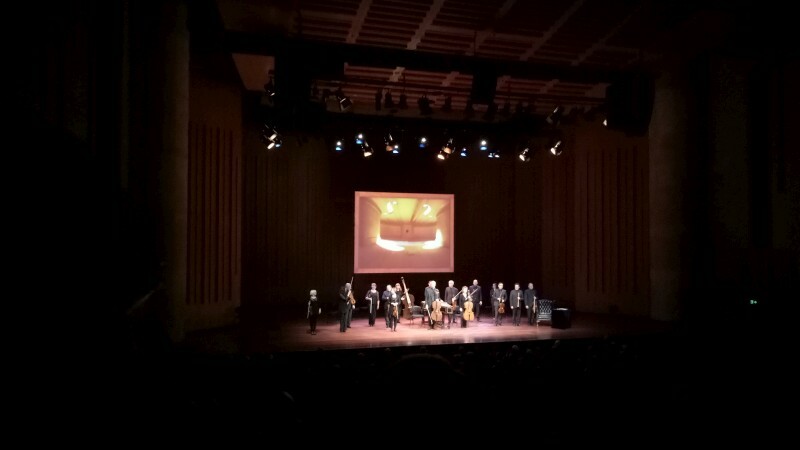 Tafelmusik performed music of Bach accompanied with visuals and narration under the title Bach and his world. The program was conceived, developed and scripted by Alison Mackay (bass) with Elisa Citterio (violin, director) and Blair Williams (narration). They performed for Musica Viva at Llewellyn hall. You can't say Maruki Orchestra shirks at challenges. After all, it's a local, community orchestra but it takes on the big, real works and gathers them into intimidating programs. This concert was a star example. First set was Mussorgsky Night on Bald Mountain, a demanding, often virtuosic tone poem with all manner of feels throughout. Apparently telling a story of a gathering of witches: the assembly; chatter and gossip; Satan's cortege; Black mass; Sabbath. Then a symphony, no less, before interval. This was a little cutie, Bizet Symphony in C major, written when he was aged 17 and only performed after his death. It's a lively thing, pretty, reminiscent at times of horse riding. I thought little of it early on, but it grew on me. Then interval and afternoon tea. Then the continuation of an unusually built program. 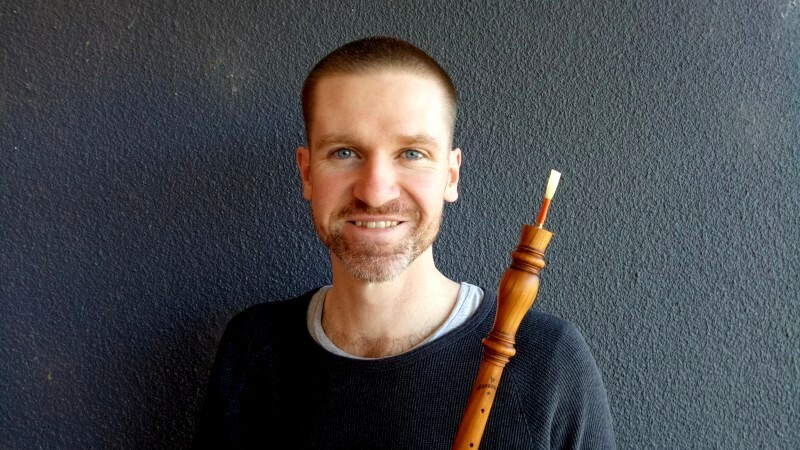 Bach Concerto for Oboe d'amore BMV1055r played by Ben Stewart. Bach is deceptive, sounding lithe and light and bouncy so apparently easy, but it never lets up and there are always some tricky phrases. No less here, especially in the quick first movement. The second is lovely; the third quick again but more malleable. Ben did a great job on his first concerto outing on this relatively rare instrument. Then, to finish, the most challenging piece of the day, Elgar Enigma variations. Everyone knows Nimrod, of course, and it's deliciously inviting. Enigma is a work of 14 variations on a simple theme that's outlined first up with each movement is dedicated or influenced by someone known to Elgar. Some are hugely tricky or quick or varied. There are accelerandoes to cause fear and polyrhythms and all manner of intricacies appearing to just disappear with another variation. Not easy but well known. The orchestra always rises to performance, playing remarkably better on stage. Not professional, of course, but presentable. The feels were solid and time didn't drag although some intonation wasn't quite perfect. But a worthy outing and an excellent immersion in a huge classical program. Thanks to John and all. Maruki Community Orchestra performed Mussorgsky, Bizet, Bach and Elgar under John Gould (conductor) at the Albert Hall. Ben Stewart (oboe d'amore) soloed in the Bach concerto. Of course, Italian pizzas aren't offered "with the lot" - they are far more refined and tasteful than that. But I was surprised to find our pizza at Antica Ricetta in Manuka came with a singer from Milano. Just vocals with a backing track from a mobile phone. We caught a string of standards, Night and Day, Cat Stevens, don't remember the others, with a delightful northern Italian accent and that certain seriousness the Italians give to having fun. Nice. 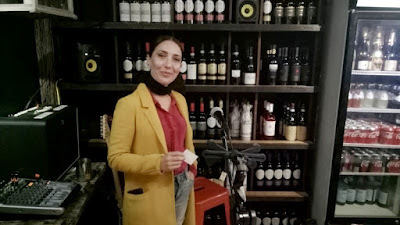 Mara Presti was the performer and the pizzas were great and the grog (6 Italian beers; a string of Italian wines) was all Italian at reasonable prices so I was happy. Mara Presti (vocals) sang at Antica Ricetta pizzeria in Manuka. My apologies: I originally misnamed the restaurant as Antica Rustica. It's actually Antica Ricetta and the change is in place. I was unavoidably late for Miro's amusingly named local band, the Burley Griffins, but was hugely gratified that I made it. The BGs are Miro with John and Hugh and Brendan and Mark. A local jazz supergroup if ever there was one. I amuse myself by wondering what some of the Indie acts or listeners think as they enter or pass by Smiths hearing this intense, virtuosic music in evidence. 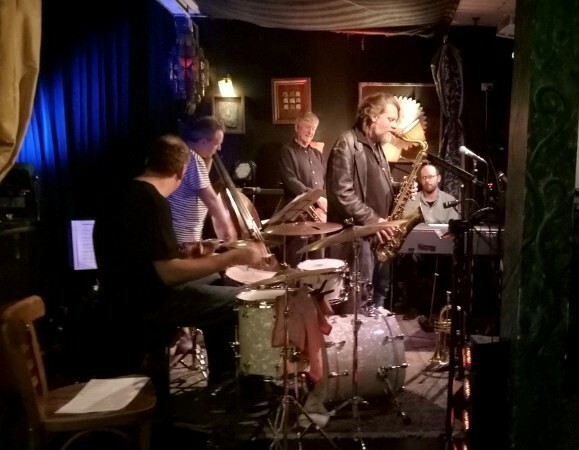 This is music that would comfortably grace any jazz festival stage and it's just a Thursday night in Canberra. I came as they were playing some simply structured bluesy hard-bop of '50s style. I was floored to hear this clarity and relaxation with intensity. Brendan settling the groove but with easy augmentation; Mark all percussive enumerations; Hugh adding restrained colour and rhythm; Miro's melody; John's intensity and overwhelming harmonic excursions. These days it's from another era but it's music all raw but hugely elaborated and deeply intellectual. Bird said it with his practice all day then forget it all and just play. Then one of Miro's originals of deep beauty, his meditation in 9/8 called Dakkar. Then some seldom-played masterpieces of the modern era, Zawinul In a silent way and Wayne Shorter Pinocchio. Then to end, the uber-common modern jazz standard, Footprints. I missed the adventure of the earlier tunes , but they played Footprints with a ravishing energy that again stunned me. So, a night with the locals. I know how good they are but it's still a surprise. Why is it so? Another stunner at Smiths. 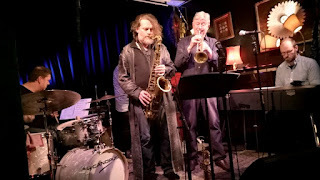 The Burley Griffins were led by Miro Bukovsky (trumpet, flugelhorn) with John Mackey (tenor), Hugh Barrett (Rhodes), Brendan Clarke (bass) and Mark Sutton (drums) at Smiths. For me coming up are three weekends with five gigs: three classical and two jazz. It's busy but I'm enjoying it immensely. Hope to see someone at one or another. Just a pic of the Forrest National Chamber Orchestra in rehearsal. 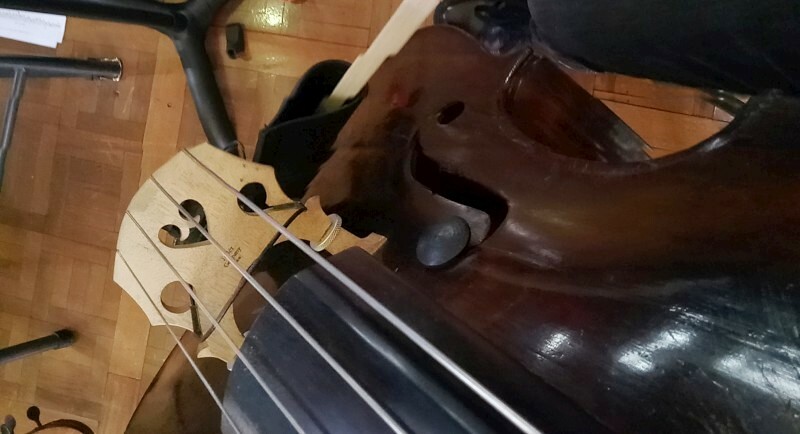 I'm providing bass for a friend who had to pull out so not much preparation but some lovely music by Handel, Faure, Marcello and Sibelius with Dvorak Serenade for Strings as the feature. It's all new to me, but this is a fabulous piece. Forrest National Chamber Orchestra (FNCO) is performing under Gillian Bailey-Graham (conductor) with Rebecca Lovett (concertmaster) at CGGS Chapel 2pm 27 May. What a pleasure to be asked to record Igitur nos. I've recorded them many times in concert, of course, but this was in rehearsal, in the organ loft at St Paul's. I was there with them, veritably engulfed in the sounds so that individual parts, especially the higher voices, the tenors and sopranos, were clear and immediate, and with forceful pipe organ driving it all from just metres away. This is blissful when all is prepared and they are going for a decent take. There were some stops and starts, some practices of segments, but also some terrific takes on various religious musics: 2 psalms, Palestrina and 2 from Stanford. Mostly in English. They are to be recordings for demos. Such a pleasure to be amongst it all. Igitur nos was led in rehearsal by Matthew Stuckings (conductor) in the organ loft of St Paul's Manuka. I attended too few events for this CIMF but I did get to the finale and it was stunningly and deeply interesting. The first half was particularly a challenge for some. For that, read contemporary! First up, Ned McGowan performed a solo flute piece, Salvatore Sciarrino Come vengono prodotti gli incantesimi. It was to be performed on bass flute, but was on standard concert flute in the end. This was all tonguing and valve slapping and occasional sudden crescendoes. More rhythm then melody. 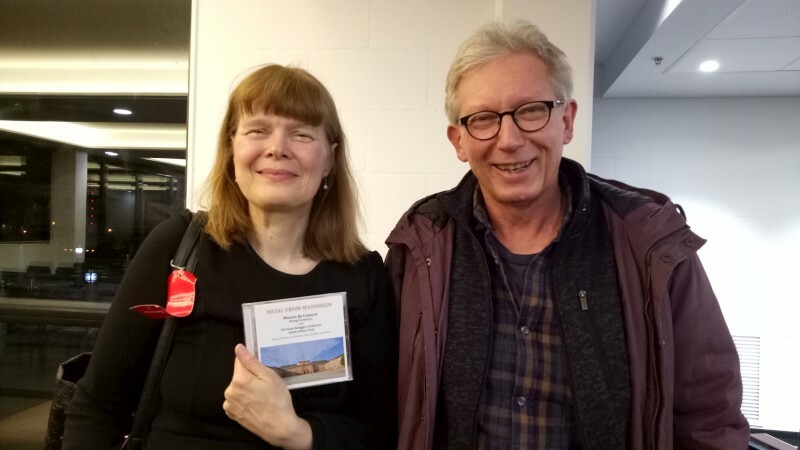 Then a premiere by resident composer Mary Finsterer called In praise of darkness inspired by Jorge Luis Borges' book of the same name about his loss of sight. Played by the Festival Sinfonia and directed by Roland Peelman. Five movements, often a tuned percussion background (marimba?) 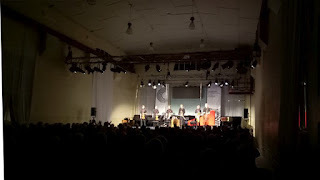 with strings in slow crescendoes and sudden decrescendoes (in synth parlance, where we most hear this, long attacks and sudden releases), occasional manic church (tubular) bells accompanied with sudden green lighting then hand drumming; later angry whale sounds, long notes over a choppy semiquaver rhythmic phrase, Chinese gongs and woodwinds and bass drums. I guessed the work was mainly in 6/4, but I could be wrong. Counting must have been hard. It was extended (~40mins) and some questioned that but I liked it, all darkness and depth and anguish and resolution. Then interval then Alice Giles featuring with a string section on two Debussy Dances sacrées et profane. Deliciously played and closer to home for some of the audience. And to finish, the Festival Sinfonia appeared again under Roland with solo violinist Tim Fain playing Bernstein Serenade (after Plato's Symposium). This was a new work to me and several others I talked to, but still familiar. The colours and instrumental combinations of West Side Story (think Rumble or Krupke) were evident. And the references were classic too, if older than WSS's Romeo & Juliet. It comprised five movements named for characters and themed about love and formed as an unlikely violin concerto. Tim Fain was strong and comfortable and I thought he looked very satisfied at the end. But a fascinating work that will get a workout on my Naxos or Spotify streams. Then an after-party for the players and supporters. There's fun in that, of course. Next year is CIMF no.25. A truly impressive tradition that I can only hope grows and grows. 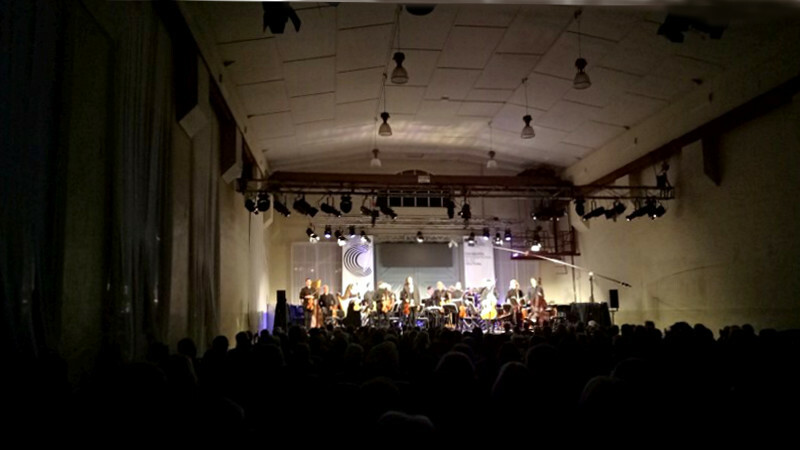 The CIMF2018 Festival Finale at the Fitters' Workshop featured Ned McGowan (flute), Alice Giles (harp), Tim Fain (violin) with the Festival Sinfonia under Roland Peelman (conductor) playing Sciarrino, Finsterer, Debussy and Bernstein. Our CIMF this year was quiet in terms of concerts, not least because of other commitments, but was none-the-less involved. 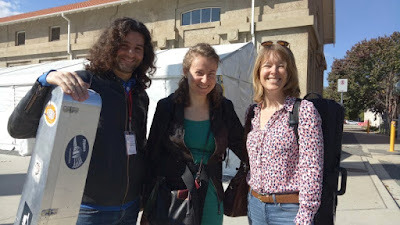 We are part of the crew that billets and drives musicians for the festival and it keeps us busy. This year we were blessed with billetting Dutch/Italian violinist Cecilia Bernardini, a lovely guest and a stunning performer. I may have bored her with amateur chatter about music, but she was gracious and informative: about violins and the lovely one she was performing with (an Amati from Cremona's golden age); tech matters like the various bows she uses for different musics and how frequently she changes her (gut) strings; her life on the road as a professional musician; her partner's and family's relationships with music; her involvements with various groups. 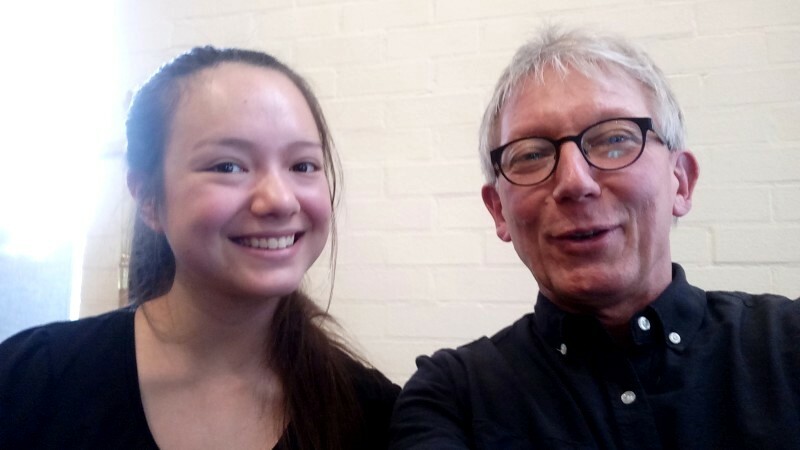 She plays regularly with Scotland's Dunedin Consort and also in groups in Rome and Paris (ah, modern European life! Why Brexit, I wonder?) 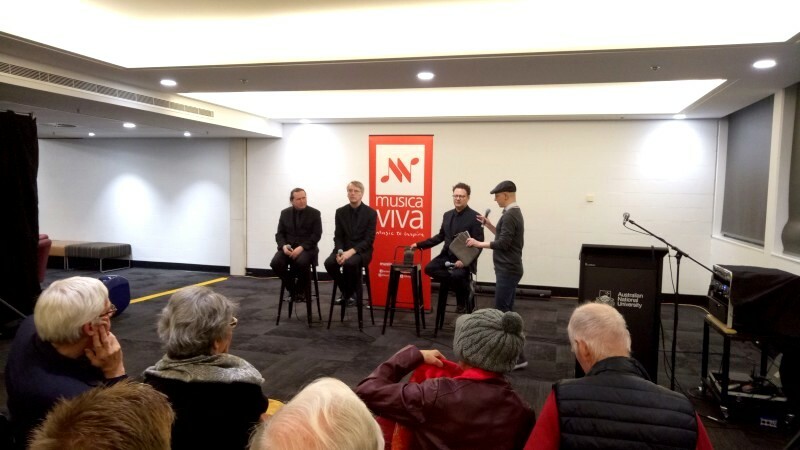 and has twice led Canada's Tafelmusik which is visiting Canberra for Musica Viva in a few weeks time. And just those friendly discussions of life and the rest that ordinary people indulge in. The sound of her practising was a pleasure: a serious performer on a serious instrument preparing Beethoven and Schubert and the like. It's wonderful to welcome guests, musical or otherwise, and a great pleasure and honour to host Cecilia. 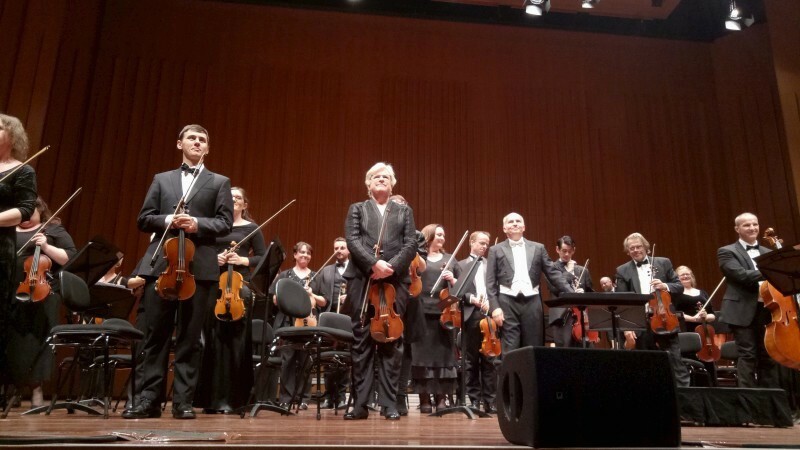 Cecilia Bernadini (violin) was our guest for the Canberra International Music Festival 2018. BTW, Cecilia is the in the middle, in green, in the pic above.